Think about how much food you and your family throw out every day. It might not seem like a big amount, but it adds up over time. 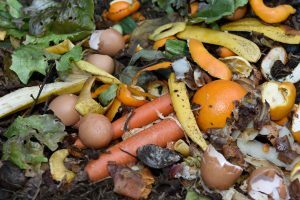 All those food scraps you throw out end up in landfills, where they pollute the environment. If you want to cut down on this waste and do a bit of natural recycling, consider composting. When you set up a compost pile, you add food scraps and other materials to it that will break down over time. These materials then become nutrients that keep soil healthy. Composting also keeps these materials out of landfills, which helps protect the environment. So, how do you get started? Here’s some helpful information on setting up a compost pile in your own yard. Keep in mind that you can also compost indoors in a special bin if you don’t have space outside. Choose an area in your yard that’s shady, dry and close to a hose or other water source. Ask your parents to help you set up a compost container with bricks, chicken wire or another material. Make a square-shaped container that’s around four feet high and four feet wide. Compost materials come in two groups: brown and green. Brown items include branches, pine needles, twigs, and leaves, while green items include leftover fruits and vegetables, grass clippings and coffee grounds. It’s also ok to compost some other materials, like eggshells, paper, cotton rags and even hair. What shouldn’t you include? Don’t add anything that makes your yard smell bad, which could attract rodents, flies and other pests. This includes dairy products, meat, fish, grease, and fats. You also shouldn’t add pet waste, since it can have parasites or harmful germs. Keep diseased plants out of your compost, too, since they can infect healthy plants. Start with a layer of brown materials, then add a layer of green materials. Add a little bit of soil, then keep putting in layers of brown and green until you run out of materials. Water each of the layers after putting them in, and mix them around a bit. Stirring your compost pile every other day and giving it some water to keep it damp will help it break down faster. It should take about six weeks for the bottom layers to become dark, which means it’s done. When your compost is ready, you and your family can use it in your garden to keep the soil in good shape and prevent weeds from growing.